There any number of prominent arms who could have gone here. Toussaint, Mike Soroka, Kyle Wright and Bryse Wilson are all Top-100 prospects who made their Major League debuts last season. The same could be said for Braves No. 11 prospect Kolby Allard and No. 10 Luiz Gohara, both of whom appeared in The Show for a second straight season. With the Major League club in contention, the organization was willing to push so many arms up to help out partly because of the situation but mostly because of their individual talents. "They see if they do their job, they're going to get an opportunity," director of player development Dom Chiti said. "If they prove these things, they know they're going to get a chance. I think it's encouraging to them that they understand that -- as we told Touki, Kolby, Mike and all the others -- we don't check your IDs when you get here. The bottom line is can you help our Major League teams win games? Because if you can, then let's go." Toussaint gets the nod for most Major League-ready because of a combination of past performance and present skills. After opening last season at Double-A Mississippi, the 22-year-old right-hander made five Major League starts after his Aug.13 debut -- the most of anyone on the list above. He also made two scoreless relief appearances during the National League Division Series. Despite that time in the Majors, he also led the system with 163 strikeouts over 136 1/3 innings in the upper levels of the Minors, thanks to a plus fastball, plus-plus curveball and average changeup. Toussaint looked like he had the inside track on the final spot in the Braves rotation entering camp and has only helped his cause by giving up only two earned runs on seven hits while striking out 13 and walking one over 11 innings in his last three Grapefruit League appearances. It's that one walk that points to his biggest improvement as control issues are what largely held the 2014 first-rounder down earlier in his career. "His game grew most from the mental side," Chiti said of Toussaint's 2018 season. "He's always had tremendous stuff, but mentally, he started understanding how to use it and how to repeat his delivery. He gained command of his pitches as a result." 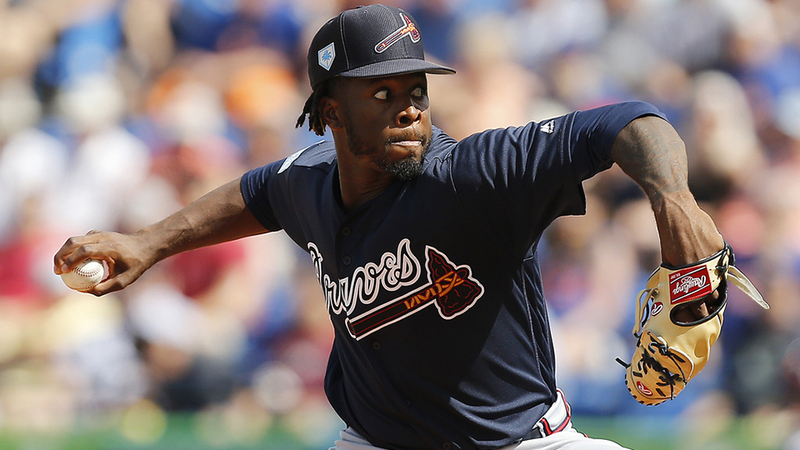 With Mike Foltynewicz out to begin the season with elbow tightness, Toussaint should enter 2019 as Atlanta's No. 4 starter. He could be more than that by season's end. Pache might be one of the system's most electric prospects, even if he didn't hit a lick. The No. 37 overall prospect has been praised for his glove in center field since signing in July 2015, and that admiration has only grown as he climbs the ladder toward Atlanta. Possessing 70-grade speed, he's able to cover a lot of ground in the middle of the park and adds to that range with impressive instincts. His arm also receives plus-plus grades, backed up by his 33 outfield assists over four seasons. The Braves already have a three-time Gold Glover in center in Ender Inciarte, but Pache's defensive ceiling could be just as high. "I mean, he's playing a premium defensive position, where everybody wants a center fielder that can really go get the ball," Chiti said. "But what has made it? A lot of hard work on his part. If you watch him work during batting practice, he pays a lot of attention to detail out there. He does the same thing with his batting, too. He enjoys playing defense, and it really shows." The 20-year-old's bat will determine how quickly he could join Inciarte and Ronald Acuña Jr. with the Braves. He hit .279/.307/.410 with nine homers in 122 games last season between Class A Advanced Florida and Double-A Mississippi. It's just a fact of life that there are only so many spots in a Major League rotation. There's the crew of pitching prospects that pushed for those spots in 2018 and there are others, like Ian Anderson, Joey Wentz and Kyle Muller, who might not be far away. Someone inevitably will be left behind, either with a rotation spot or as trade bait, and it's possible that Allard will meet that fate. The one-time top prospect was effective at Triple-A, where he posted a 2.72 ERA with 89 strikeouts over 112 1/3 innings. However, he got shellacked in three Major League appearances, including one start, to the tune of 11 earned runs in eight innings. He surrendered three homers and walked more batters (four) than he struck out (three). Those obviously come in a small-sample, but Allard's stuff (average fastball, above-average curve and change) haven't taken the jump necessary to muscle out the other arms around. The 21-year-old left-hander has time, given his age, and special command on his side, but he'll need to show big-time growth to muscle his way past the current group of Major League/Triple-A arms and hold off those coming quickly. "One thing you have to understand is good athletes have to see what they're up against," Chiti said. "If things are working and then all of a sudden they're not working, that gives the player or pitcher an opportunity to make adjustments in their game. I think Kolby will make those adjustments and he'll be fine." June 18, 2017. That's the last time Weigel made a meaningful start in the Minor Leagues. He underwent Tommy John surgery shortly after and made four rehab appearances in the Gulf Coast League last August. The Braves also had their 19th-ranked prospect pitch in the instructional league and, after a full offseason to prepare and build up again, he enters the 2019 season with an eye on getting the Major League debut that eluded him before the injury. "He's fine," Chiti said. "He's 21 months out. He's throwing with no restrictions. We'll probably still go slow with him just to get him built back up. The biggest thing to do with that has nothing to do with health. He just hasn't pitched in a competitive game in a while, so we'll go slow with that. But he's fine." When healthy last fall, Weigel hit the upper-90s with his fastball, and his other offerings could be Major League average pitches. Chiti added that his stuff is better now than pre-surgery, and should that assessment hold up early this season, the 24-year-old right-hander could crack the Major League roster, especially if he sticks to the bullpen. In a way, Alexander already has broken out. After two unproductive years at Ball State, he transferred to State College of Florida, Manatee-Sarasota and took off, hitting .405/.476/.785 with 15 homers last spring. The Braves took him in the 20th round, signed him for $125,000 and let him play at three levels over the summer, watching him master each one. Alexander batted .352/.429/.495 with 17 extra-base hits in 52 games in the Rookie-level GCL and with Rookie Advanced Danville and Class A Advanced Florida. Even at the highest of those affiliates, he was an above-average hitter as he produced a .325/.386/.450 line in the traditionally pitcher-friendly Florida State League. The 22-year-old third baseman already could possess one of the better overall hit tools in the system and enters the season as the Braves' No. 23 prospect, despite his Draft status. A longer sample of success back at Class A Advanced or even at Double-A would send his stock soaring even higher. "If you look at him amateur-wise, he hit there, so it's not a big surprise that he hit," Chiti said. "But he's got a really good swing, a really good approach and he loves to play. The ingredients are there to be a good player. He uses the whole field. He's got power to all fields. It wasn't a surprise to any of us." More to keep an eye on: Ranked 38th overall, Austin Riley is right there with Pache for being the system's top position player, thanks to his hit and power tools. He could have been pushing for a Major League spot this spring, but the signing of Josh Donaldson put the kibosh on that for now. He prepared to play some outfield in the offseason and has seen time at first base this spring to give him options for a potential big league debut. ... Kyle Wright might be working his way into the rotation conversation in just his second pro spring. The Foltynewicz injury opens a spot and, with an improved delivery and four above-average to plus pitches, the No. 30 overall prospect has impressed in Grapefruit League play. All four of his Major League appearances last season came out of the bullpen, but he has the profile of at least a mid-rotation starter. ... Mike Soroka might have the heighest ceiling of any Braves pitching prospect due to his stellar control and three-pitch mix, and that helped him make his big league debut last May. However, he missed the second half of the season with a shoulder injury and an unrelated shoulder strain held him back this spring. He's back on his way to health, having thrown live batting practice this week, and will require close watching if and when he opens with Gwinnett. ... It's becoming increasingly clear that William Contreras is the Braves' catcher of the future. His biggest assets are on the defensive side, but his bat made enough of a jump at Class A Rome and Florida last season that he projects as a Major League starter. As everything rounds into place, he should be a Top-100 prospect by season's end.